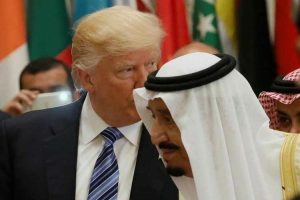 The Saudi monarch is expected in Washington early 2018 to meet with US President Donald Trump for talks after the two leaders stepped up ties between the two historical allied countries. The White House Thursday said the two leaders held a telephone conversation in which they discussed how to advance shared goals such as strengthening security and prosperity in the Middle East. King Salman’s future visit to Washington will be a courtesy response to the US leader who chose Riyadh as first foreign country since taking office in January. Trump’s visit last May was signalled as revival of ties between the two countries as US-Saudi relations cooled down during President Obama’s tenure. Riyadh criticized the Obama administration for bringing rival Iran back in the community of countries following the nuclear deal. Trump reassured Saudi Arabia of America’s ironclad support against Iran and in the fight against terrorism.